January 19, 1981. From the confluence with the Sacramento River to the Nimbus Dam. Recreational — 23.0 miles; Total — 23.0 miles. 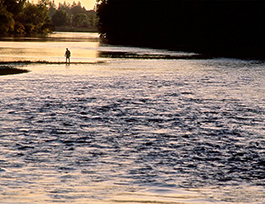 This short stretch of river, flowing through the city of Sacramento, is the most heavily used recreation river in California. It provides an urban greenway for trail and boating activities and is also known for its runs of steelhead trout and salmon.